On Labor Day I inspected the hives for the first time in probably a month and a half. No honey, which wasn’t terribly surprising considering we’ve had a dearth here since the end of July. They’d had plenty of stores, which they’d done a good job of consuming. 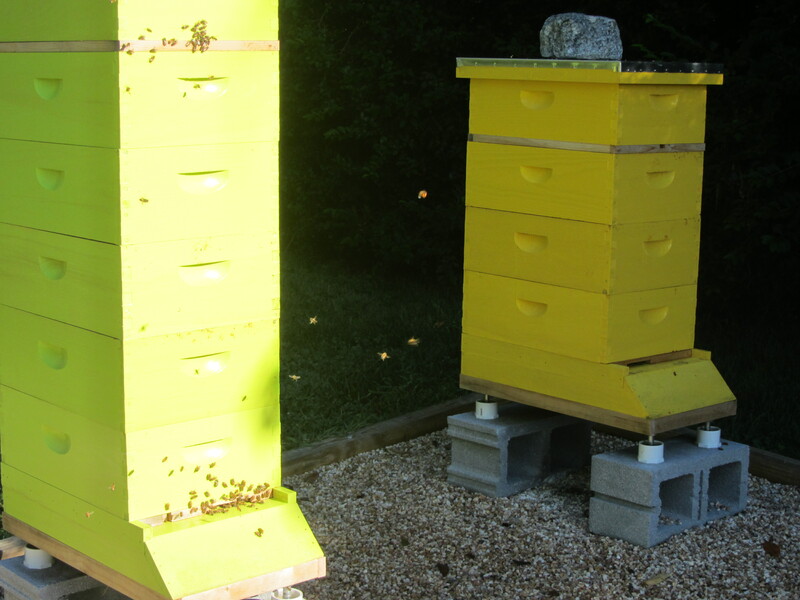 I swapped frames around, removing the supers and adding honey frames back to the hives. 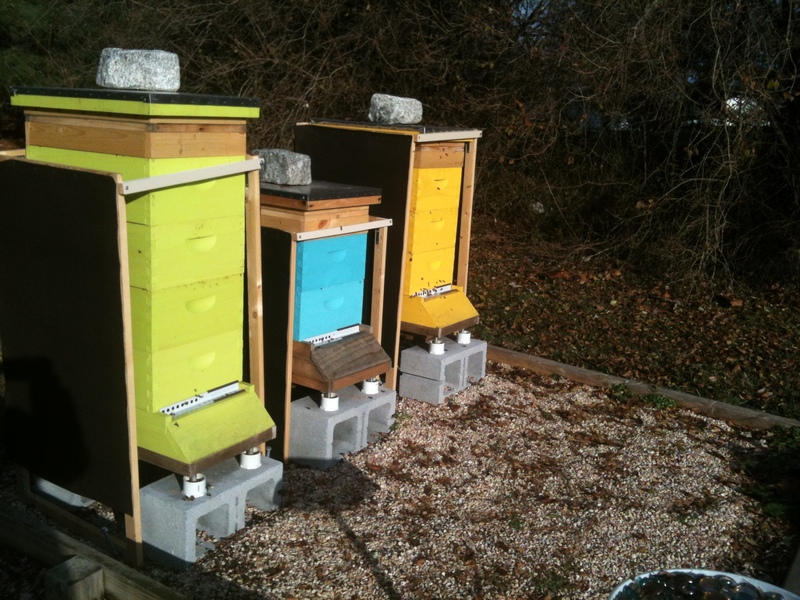 All hives had brood, but the numbers had dwindled in Purple and Green hives. Even in Blue Hive the brood patterns were very spotty. That meant either (or both) the queens were weak, they were queenless, or varroa mites were in full force. From what I’ve heard, mite counts are high this year. But I have hygenic, mite resistant bees, and I don’t treat because I’d like for them to stay mite resistant. I returned to the shop with frame filled supers, a collection of wet nectar and honey frames, dry untouched frames, and dry drawn comb. 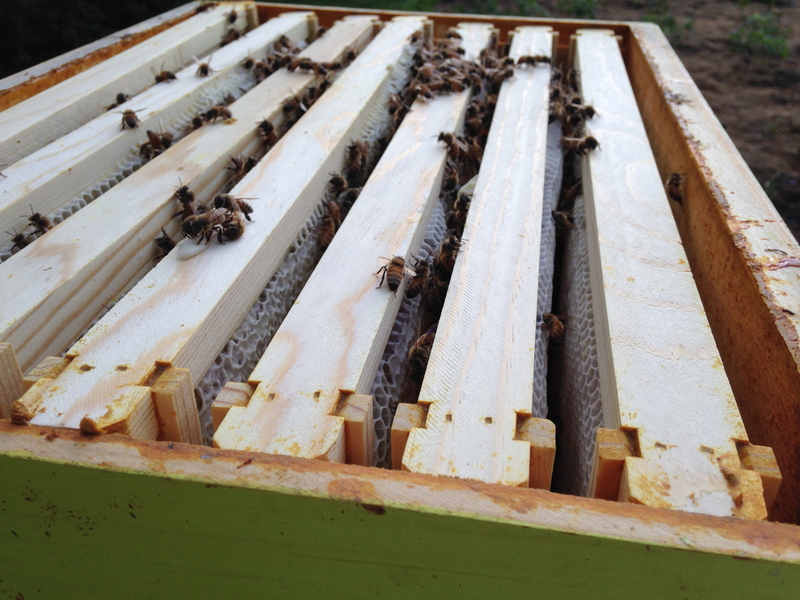 I separated the frames – dry, wet, honey. Wet frames were set outside so the bees could clean them up (farther than 50ft from the hives, of course). 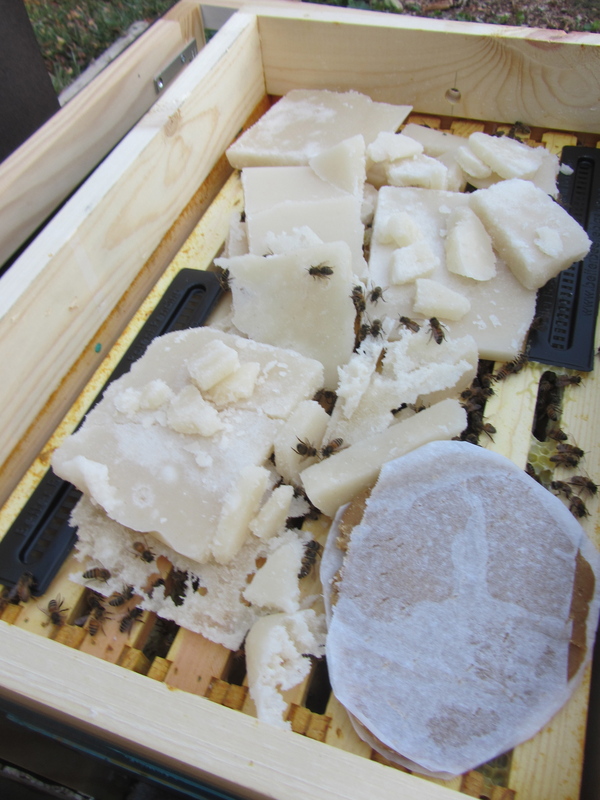 Honey frames were wrapped in plastic and frozen, and dry frames (including the frames cleaned by the bees) were stacked and stored with moth crystals. It was a busy afternoon, but at least I knew where the girls stood. Immediately, I began looking up sources for queens since I hadn’t seen any signs of varroa – the bees looked healthy, no wing deformity, no signs of mites on the bees or larvae. BeeWeaver is where I purchased my existing queens. 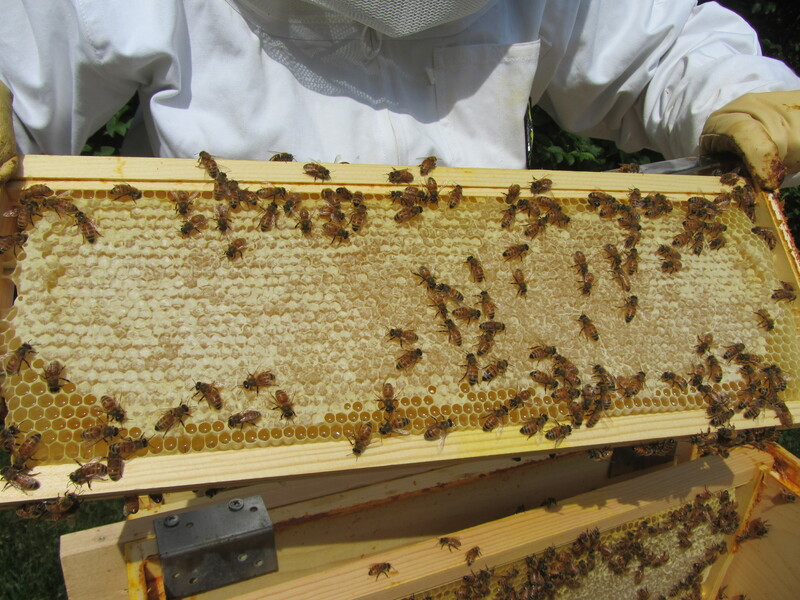 The bees started out hot, but they are mite resistant, fast producers, and hardy in the winter. The problem was they had no queens available until mid-October. I can’t wait that long. I need queens now so they have some chance of building up their populations before the cold weather gets here. I hate to mix my bees again and would prefer to keep the BeeWeaver lines going, but I also don’t want to risk losing three hives. 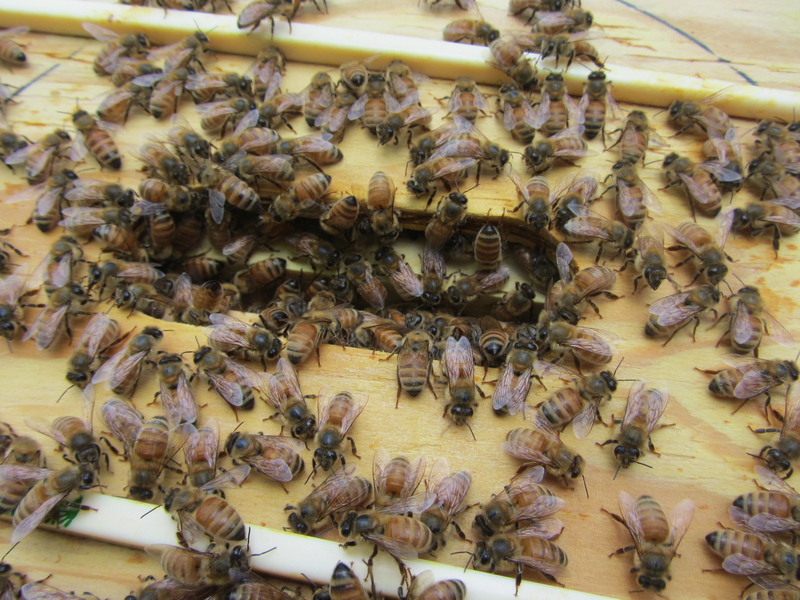 The hardest thing about beekeeping is finding a queen when you need one. I can understand completely why people choose to rear their own queens. 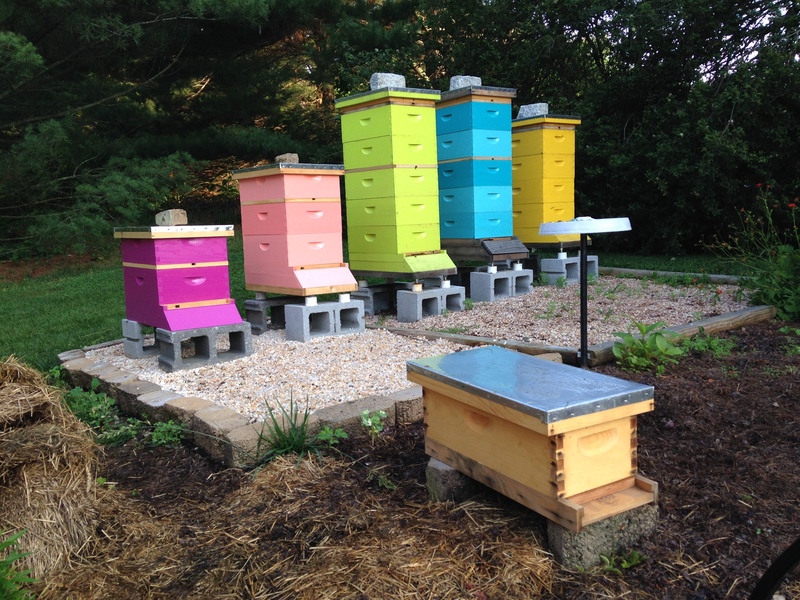 Or better yet, next year I might put together several nucs in July or August so I’ll have one or two queens and some extra bees available if needed. Fortunately, I was lucky enough to find a private queen breeder in Pennsylvania, a retired USDA employee with vast knowledge and experience who rears his own hygenic queens. They weren’t cheap, but they’re in the mail. Lesson learned – what looks good on the outside may not bee so good on the inside. A lot can change over the course of 2 or 3 weeks, so keep up with inspections at least every 3 or 4 weeks. 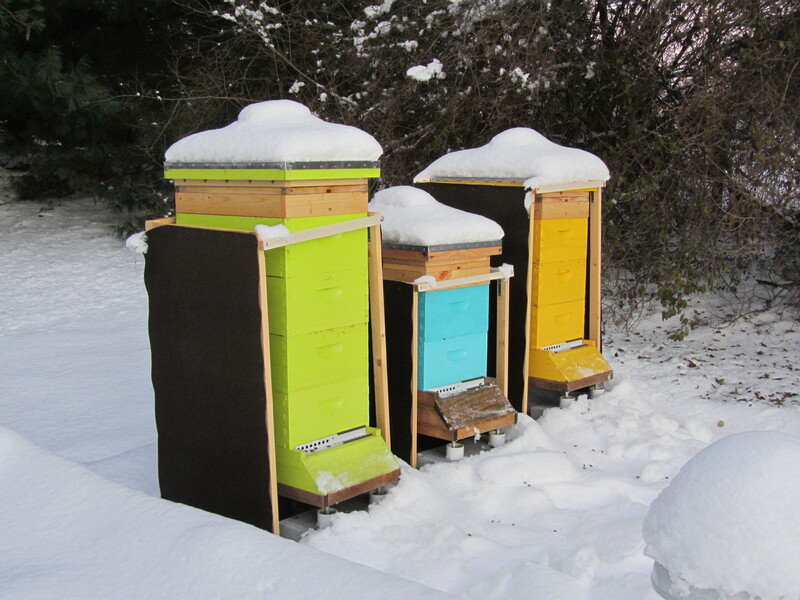 Hives after a recent snowfall. My Christmas present came a few days early this year. 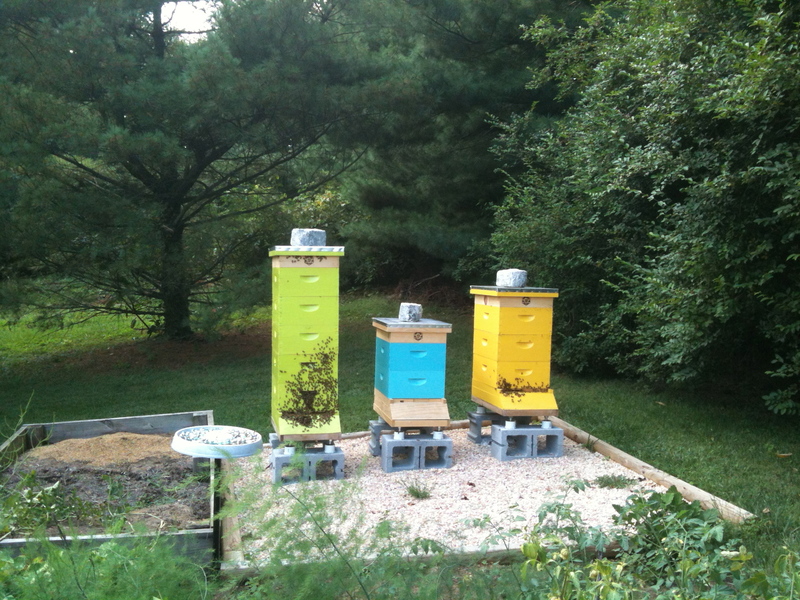 A sunny 60 degree day revealed 3 active hives. I couldn’t be more excited and more grateful after a month and a half of cold and snow and wet, which for a beekeeper equates to waiting and not knowing. 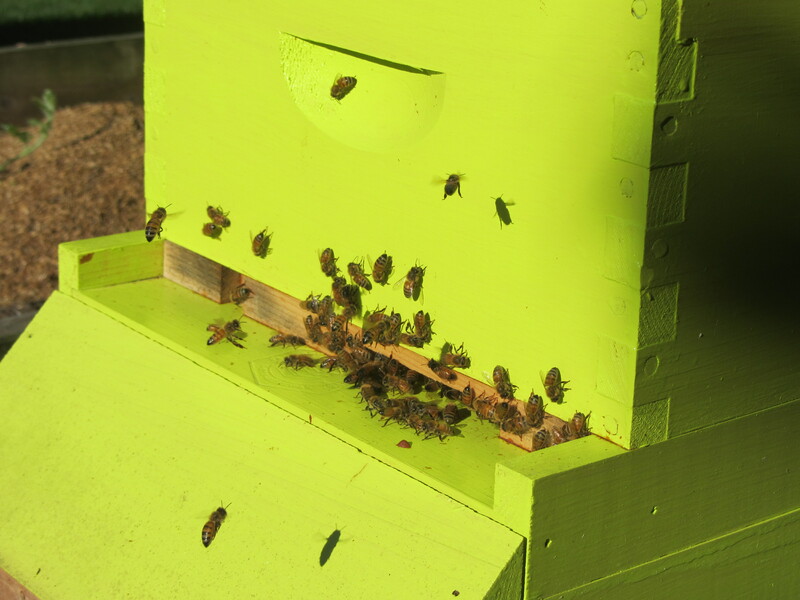 Yesterday morning, Green Hive 1 and Yellow Hive 2 were busy with bees flying in and out, taking their much needed cleansing flights. Yes, bees have to relieve themselves too or disentery could set in – one of many potential problems faced by the bees during the winter, along with excessive moisture, mites and pests, starvation and disease. The bees can actually take quite a bit of cold, so freezing is not usually a problem. 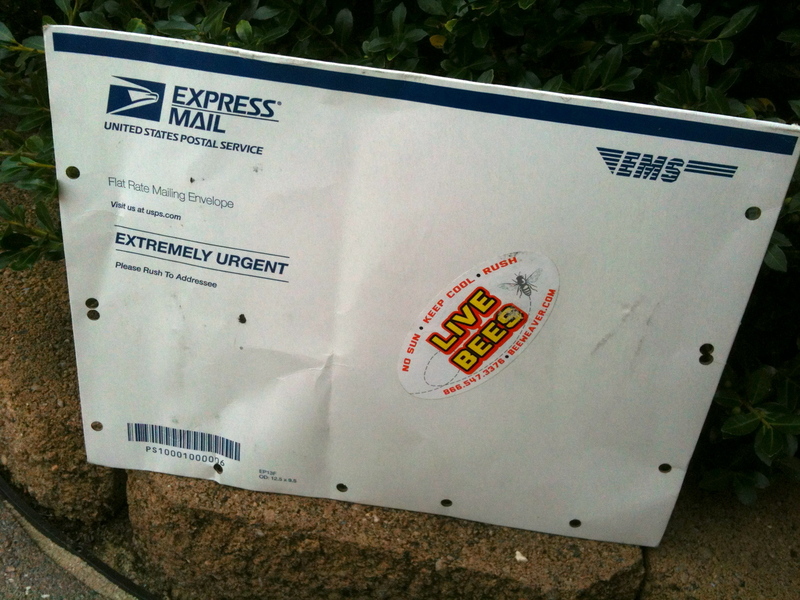 Heck, bees are commonly kept all the way up through Canada. If they can take those temps, then 30 degrees is nothing. A few weeks later, 60 degrees and sunny and the bees are alive and well! Later that afternoon, Blue Hive 3 had joined the activity. Everyone was out and about, cleaning house and enjoying the sunshine. I opened the tops to add more food. Who knows when I’ll get a chance to peek in again. The girls were buzzing around me a little, but they were surprisingly docile, and many were up top enjoying the candy. I piled up their food stores and put them away til our next 60 degree day. Adding food to help them through the coming months. This photos actually shows what not to do. Only cover 1/4-1/3 of the frames on the side that first receives the morning sun. 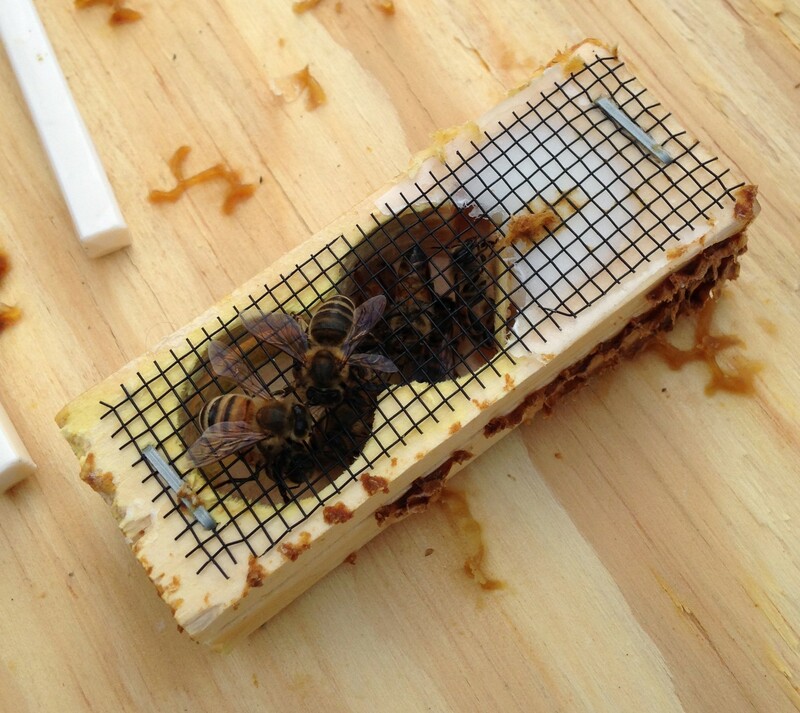 Too much coverage impedes air flow and can cause moisture to be retained in the hive. We still have a long way to go. 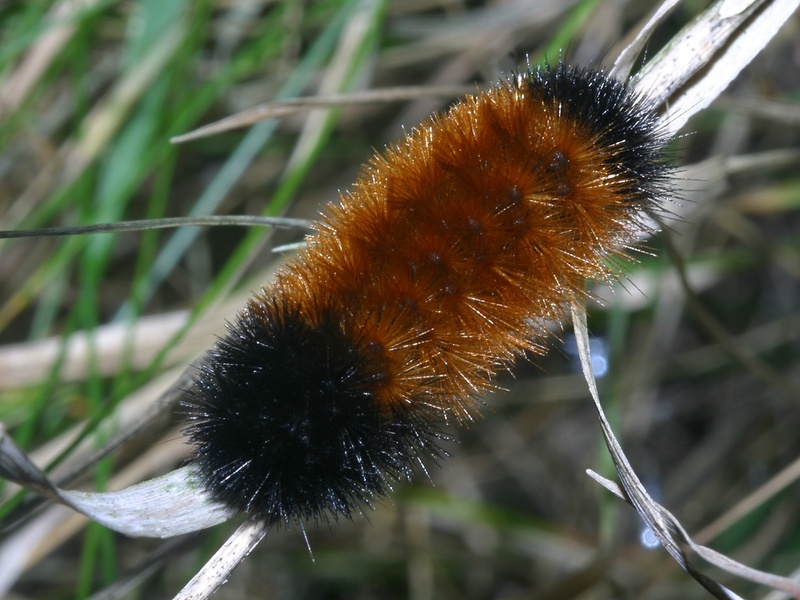 January and February could be brutal, and their numbers have dwindled – typical for winter when they’re focusing on staying warm rather than reproducing. Remember, the life of a worker bee is only about 21 days. The closer we get to spring, the more the bees will begin eating like crazy. This is often when the starvation sets in. The trick is to always stay 5 steps ahead. Now I know they’ll survive our cold, that their stores are good. I didn’t realize how much I had missed them. A wonderful gift indeed – a day of validation that my bees are still alive and that I must be doing something right. Now I sit back and wait some more, and continue to hope. Best wishes to everyone! May your holidays bee merry and bright! And may you and your bees bee healthy and happy in 2014! Last week YH2 was in dire straights. Still no queen to be found, no brood, and their activity seemed lifeless. They’d been like that for at least a month, despite my attempts to transfer brood from GH1, condensing the hive down to 3 boxes, and adding some pest control tactics. So I broke down and ordered a new queen from Texas. We anxiously tracked her arrival. She was shipped on Tuesday and she was scheduled to arrive on Friday – the one day that the hubster and I had planned on going away overnight. The hubster’s buddy was kind enough to pick her up and he dropped her off at our house on Saturday. So she was there when we got home. 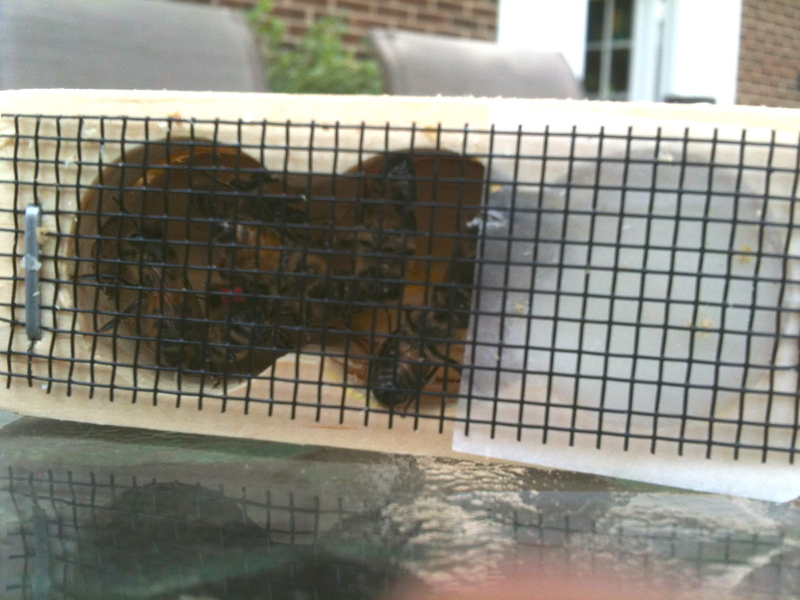 She is a nice large healthy marked queen, confined in a tiny little queen cage with 4 or 5 attendants. I was anxious to get her out of that cage, so I suited up and got ready to make the introductions. Red dot marks the queen! A queen must be accepted slowly by her new colony. If she is released directly, then the other bees will think she is an intruder and they will kill her. Also, if she is released and the old queen still exists in the hive, then the two queens will fight to the death and the strongest will survive. So to make sure my $50 queen was safely accepted into YH2, I first had to do a thorough inspection to verify whether the old queen was still in the hive. Box 3 is filled with heavy frames of stored sugar syrup honey. Each frame must weigh at least 5 lbs each, so the box itself weighs about 50 lbs. These frames will keep the girls well fed throughout the winter. I worked my way down to Box 2. I pulled the second frame and the hubster pointed and yelled “what the heck is that”. I flipped the frame over. Low and behold, there was a beautiful, large, long sleek, unmistakable unmarked queen. I don’t know when, how, who, what, where or how, but YH2 requeened itself! I looked and never found a queen cell, so this was the last thing we expected to find. I’m thrilled that YH2 has such a gorgeous queen, and I’m also thrilled that the hubster (yes, he saw her first) and I were able to identify her unmarked. We were so excited we forgot to take a picture. Ugh! We pulled more frames and found capped brood, larvae, and eggs. None of this existed a week ago. The young queen is laying well. And then confusion hit. Now what? I have a $50 queen that needs a hive. I’m not going to requeen GH1 since that queen is doing great too. I’m learning to have faith in the girls, they’ll do what’s best for the hive, given time; and I will think twice before spending money on another queen. Unless I attempt to sell her to someone in my bee club, we really have only one option. 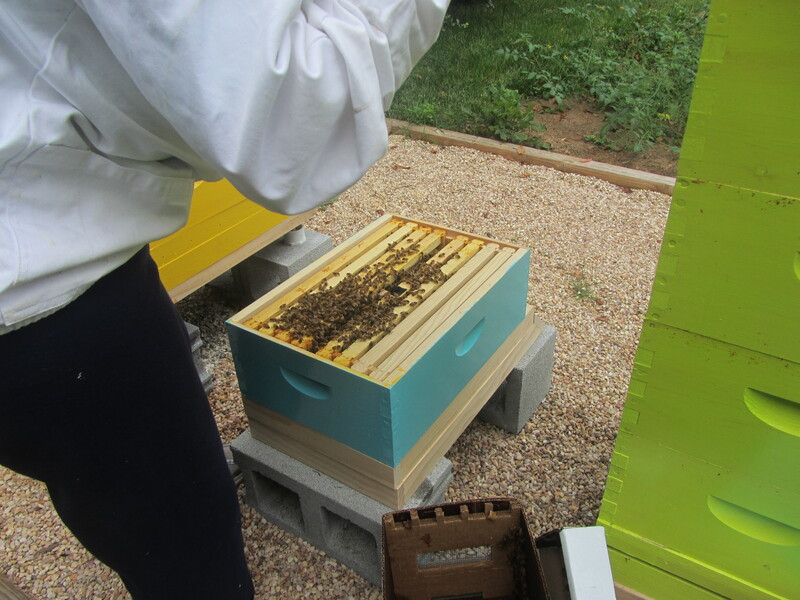 Last week we gave Yellow Hive 2 (YH2) a frame of brood from Green Hive 1 (GH1) and we added Beetle Blasters to help with the pest issues. So I had a few things to check on this week. YH2 has been inactive a docile this past week with few bees on the front stoop. GH1 likes to show off by going crazy nuts throughout the day. Complete opposites. I didn’t need to do a full inspection on GH1. It’s easy to see that hive is doing well. It has tons of bees, they’re crazy active. During their active times, I see some side trekkers sneaking over and creeping around YH2. I suspect they’re looking to rob some of their coveted sugar syrup. I’ve seen some bees fighting and I’m glad YH2 is still defending itself fairly well. GH1 is also bringing in nice chunks of pollen. A great sign that things are still blooming. I had put the box of drawn comb that was taken off YH2 into the freezer last week. I read that the best place to store drawn comb is on a strong hive, so GH1 is now 5 boxes tall. I may employ a step stool for changing the feeder bucket. Both hives have been taking in about 3 gallons of sugar syrup a week. I can hardly keep up with them. I’m still feeding 1:1 sugar to water, but since stores are needed for upcoming winter months, I’m considering switching to 2:1 syrup soon. I also found only 2 beetles in GH1’s Beetle Blaster. No other signs of beetles. GH1 is doing well all around! YH2 still has quite a few bees. 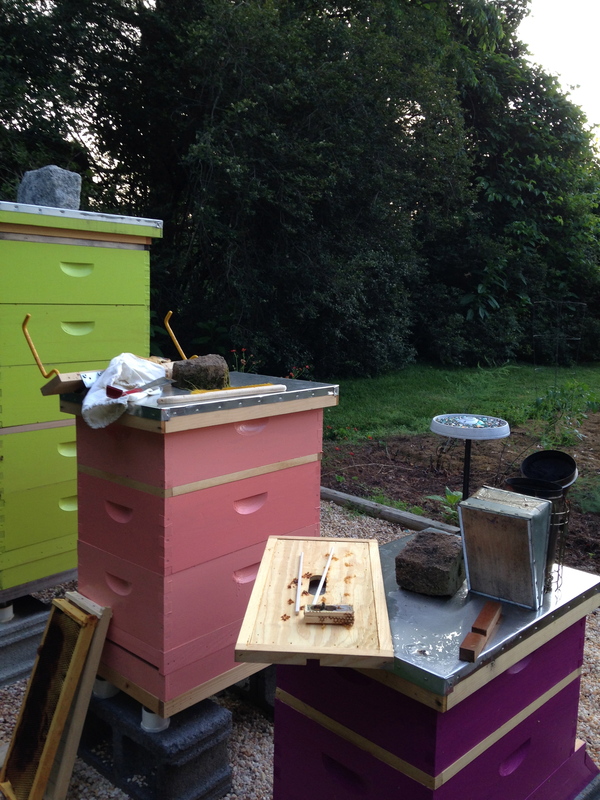 The top boxes are filled with bees feeding in both hives. YH2 consumes their share of syrup too. No hive beetles found in either trap. I was surprised since YH2 had the beetle issues. I did notice how well they had drawn the comb in Box 3 of YH2. Then I lifted it and holy moly it was heavy. They’re not producing brood, but at least they’re storing up for winter. Who took the feeder bucket? We don’t want brood! We want food! I pulled off box 2 and out ran about 10 beetles. I smooshed as many as I could, but those little buggers are fast! I hope they make their way to the top box. I will be ordering 2 of the bottom beetle trays since i think they will be most effective for trapping the beetles. I also moved one of the blasters to box 2. I checked the frames in Box 2. Mostly dark empty comb. The drone population was heavy – a sign that workers, not the queen, have been reproducing. No sign of the queen. Same situation in Box 1. 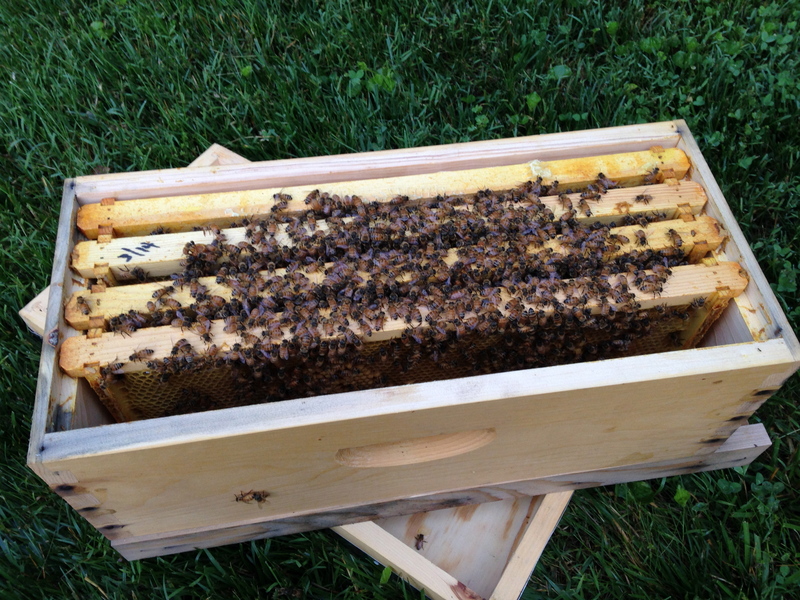 No queen, no brood, and no activity on the capped brood that I added to YH2 last week. Oh, and no queen cells. Nothing. I left them with another pollen patty, filled their feeder bucket and closed them back up. I gave them ample opportunity to re-queen themselves. Natural is always the preference, as there is always risk involved with introducing an outside queen. But I need to intervene or their numbers will continue to dwindle and the hive will die. Finding a queen locally is not easy. I ordered a new queen online from a Texas company called BeeWeaver Apiaries. They have their own strain of bees derived from the Buckfast bees. Supposedly they are easy to keep alive and they are very mite tolerant. I purchased her marked and clipped. I’m regretting having her clipped. At the time I ordered, the idea of having a queen that can’t fly away sounded good, and it only costs $1. But then my brain starts thinking it’s not natural (like declawing a cat), and then I start reading about how she can’t fly if they swarm, they chase her around the hive but she can’t go anywhere, and how the bees might think she’s injured and they may not accept her, yada, yada. Ok, no more research. I’ll just have to take extra precautions to keep them from swarming in the spring. As usual, I’m learning by trial and error. Most experts tell you to re queen in the fall anyway, so $50 later ($30 for marked and clipped queen and 19.95 for USPS express shipping) I can understand why so many beekeepers decide to breed their own queens. Ugh, no one said this hobby would be cheap. 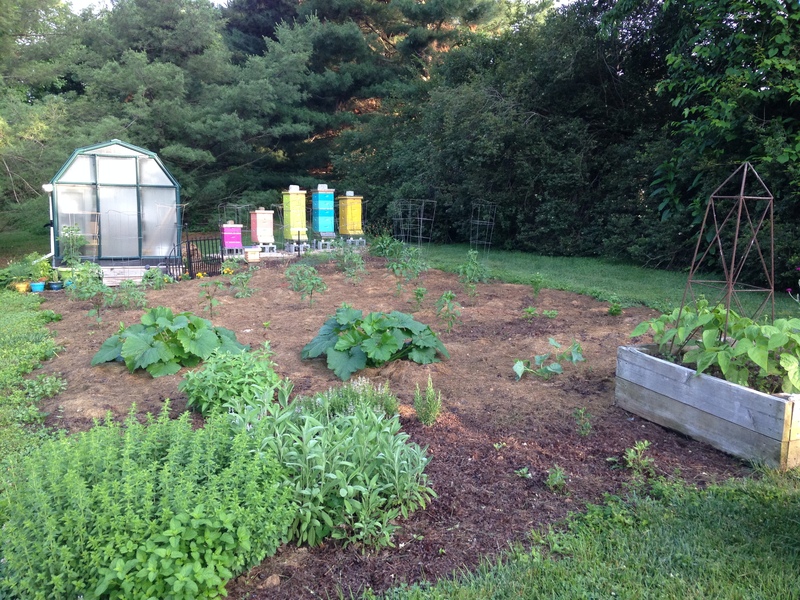 I just hope it pays off and both hives make it through the winter.